Preparing for your first event doesn’t need to be a daunting experience, the information on this page will help guide you in your preparations so you can be confident when you get to the start line and be ready to enjoy the race! If looking for your first triathlon, the Accenture World Triathlon Mixed Relay Nottingham offers a great options for beginners with the short distanced, fun and friendly GO TRI event, and if you’re not ready for the entire triathlon challenge and only want to take on a swim, bike or a run, then grab two friends and form a relay team and get the full experience for a third of the effort in the Sprint Relay. You can find out more about the '9 simple stage to race day' with our event guide. 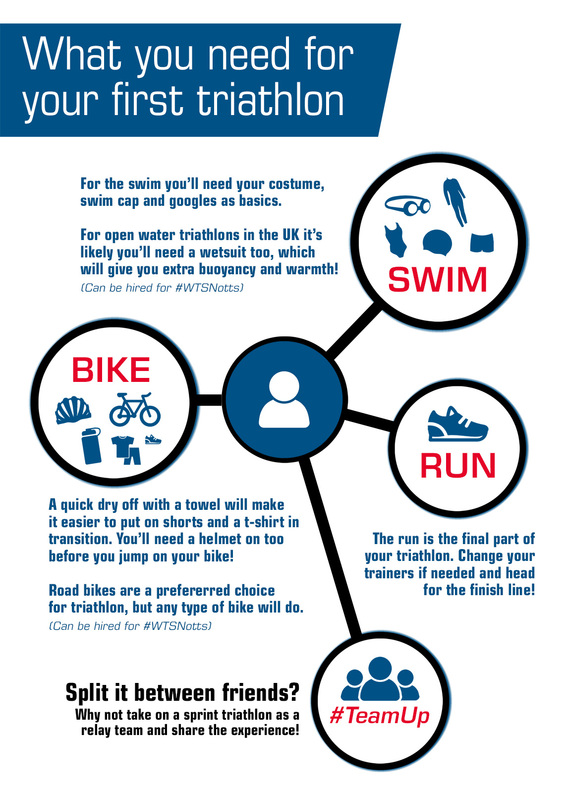 There is a host of different ways you can #MixItUp with GO TRI in the lead up to the Accenture World Triathlon Mixed Relay Nottingham with local sessions and multisport events. The free open water swim sessions are a great introduction to your first time in open water and a great way to get involved and progress as the weeks go on. Basic through to advanced cycling skills session for all abilities on closed road circuit. Session will be tailored for every level of cyclist/triathlete so all welcome. The local organising committee have arranged a low cost option for wetsuit and bike hire. Prices are £5 for bike and £5 for wetsuit and can be purchased during event entry or by logging back into the Active entry system via your confirmation email. Bikes and wetsuits hired will be ready for collection at transition on race day. Please note helmets are not included and you will need to bring your own for the cycle.